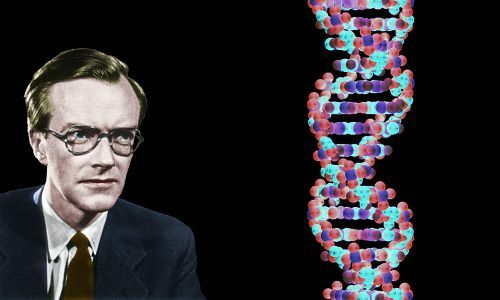 Maurice Wilkins initiated the experimental research into DNA that culminated in Watson and Crick’s discovery of its structure in 1953. Wilkins crystallized DNA in a form suitable for quantitative X-ray diffraction work and obtained the best quality X-ray images seen at that time. His initial X-ray diffraction work indicated that DNA molecules are helix shaped. He shared the 1962 Nobel Prize in Physiology or Medicine with Francis Crick and James Watson. Maurice Hugh Frederick Wilkins was born on December 15, 1916, in the rural township of Pongaroa, New Zealand. His father was Edgar Wilkins, a doctor of medicine from Dublin, Ireland. His mother was Eveline Whittacker, the daughter of a senior Dublin policeman. Both of Maurice’s parents were committed vegetarians. His parents sailed halfway around the world from Ireland to New Zealand three years before Maurice’s birth seeking a healthy environment to raise their planned family. Their daughter Eithne was born in 1914, followed by Maurice in 1916. Maurice spent his early years living in New Zealand’s capital city, Wellington. In later years he recalled how precious that time had been to him, describing the blue skies, the sea views, and wholesome vegetarian food. In June 1923, when Maurice was six, he and his family returned to Dublin. However, Maurice’s parents soon found they no longer felt comfortable in their hometown. The Irish Free State had seceded from the United Kingdom in 1922, and Maurice’s parents decided to move to the UK’s capital, London. A year later they moved to the large English city of Birmingham. Until he reached age 12, Maurice attended Wylde Green College. 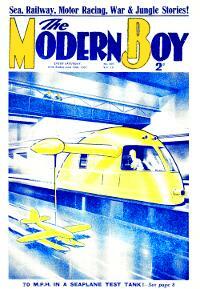 He loved reading the weekly comic Modern Boy, learning with great excitement about racing cars that moved at 200 miles per hour and the men who drove them; airships; futuristic cities; and the possibility of space travel. His father built a workshop in the backyard and Maurice began spending most of his spare time there. He discovered he was quite talented at making things and built model cars and airplanes from metal and wood. A friend of his father, a school headmaster, heard about Maurice’s interests. He suggested Maurice should set his sights on the University of Cambridge and its famous Cavendish Laboratory, whose director was Ernest Rutherford. Maurice won a scholarship to King Edward’s School, a private school in Birmingham, and started there in January 1929, age 12. He became enthusiastic about astronomy and began watching the night sky carefully with telescopes he built in his father’s workshop – he eventually ground a 9.25 inch (23.5 cm) mirror and constructed a relatively powerful reflecting telescope. In 1935, age 18, he won a scholarship and enrolled at the University of Cambridge’s St John’s College. He had intended to study astronomy, but found he could only take it as part of a mathematics degree, so he opted for physics instead. He graduated in 1938 with a lower-second-class degree – not good enough for graduate school at Cambridge. War between the UK and Nazi Germany had started to seem inevitable. Wilkins spent too much of his time on Communist Party/Anti-War activities. When World War 2 broke out in September 1939, Wilkins resigned from the Communist Party in disgust. Far from fighting Hitler, the Soviet Communists had helped him carve up Poland. Although disappointed with his degree grade, Wilkins still hoped to do research work. Fortunately for him, one of his teachers at Cambridge had become head of physics at the University of Birmingham. 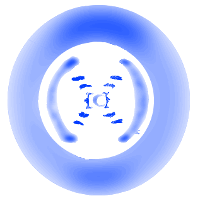 He remembered Wilkins and, on hearing he was interested in studying luminescence, sent him to see John Randall. John Randall, with whom Wilkins had a long, but not always enjoyable, professional association. 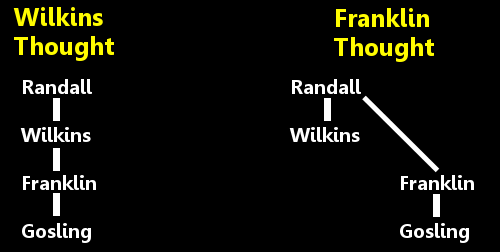 Randall took Wilkins on as a graduate student. Rather than doing research work, however, Wilkins spent several months building instruments for Randall. Wilkins felt he was being exploited, but kept going. He actually earned his Ph.D. in less than the standard three years, graduating in 1940. Randall, meanwhile, had performed brilliant work on improving the cavity magnetron. Cavity magnetrons produce microwaves, which facilitate very accurate radar detection. Randall’s device was enormously powerful compared with anything that had gone before, and it gave allied aircraft a big advantage in the air war. If you have a microwave oven in your home today, the cavity magnetron inside it had its origins in Randall’s laboratory. With his Ph.D. completed, Wilkins was eager to do something big to help defeat Hitler. The University of Birmingham already had an atomic bomb research program underway and he joined it. In February 1944, Wilkins moved to Berkeley, California to join the Manhattan Project – the allied effort to build an atomic bomb. Wilkins worked with the isotope separation group using Ernest Lawrence’s cyclotrons. In 1945, with the war over, Wilkins moved back to the UK, to the University of St Andrews in Scotland. His former Ph.D. advisor John Randall was now chair of physics there and asked Wilkins to join him. A year later, Randall moved to King’s College, London, where the Medical Research Council offered him very generous funding to build and become the director of a brand new biophysics laboratory. Again, Randall took Wilkins with him, this time as assistant director. Wilkins was tasked with solving problems in biology using the methods of physics. Wilkins was enthusiastic about biophysics – he had read the great quantum physicist Erwin Schrödinger’s 1944 book What is Life? and hoped to discover the molecular structure of genes. In 1944, Oswald Avery and his colleagues at the Rockefeller Institute in Manhattan had demonstrated that genes are DNA. Their discovery met with resistance, but the idea was gaining ground. And so Wilkins began investigating genetics. With his experience of mirrors and lenses, he developed reflecting microscopes for ultraviolet microscopic examination of DNA, RNA, and tobacco mosaic virus. He noticed under the microscope that fibers of DNA looked remarkably uniform and regular. If they were crystalline, he knew they would make a perfect target for X-ray diffraction, meaning there was a real prospect of deciphering DNA’s molecular structure. 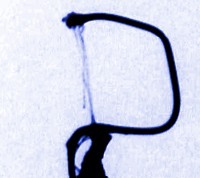 DNA provided by Signer drawn into fibers by Wilkins in 1950. Wilkins gave DNA samples to Raymond Gosling, his Ph.D. student, to take X-ray diffraction photos. The first photos looked encouraging, suggesting a crystalline structure. In May 1950, Rudolf Signer, who had prepared some truly excellent samples of pure DNA, offered them at a conference in London to anyone who was interested. Wilkins was, and he secured a generous sample. Wilkins drew the DNA into microfibers. Gosling found that under suitable conditions the DNA microfibers were crystalline. One of the physicists at King’s, Alexander Stokes, looked at the diffraction patterns in Gosling’s photos and concluded that DNA molecules were probably helix-shaped. He had already seen helical virus crystals give similar patterns. In fact, helices were increasingly the talk of the scientific world. In November 1950 Linus Pauling had published a short letter announcing his discovery of helical protein molecules. In January 1951, Rosalind Franklin arrived at King’s. She had been recruited to work on proteins, but Wilkins suggested to Randall, who agreed, that her experience was ideal for DNA work. Sadly, Maurice Wilkins and Rosalind Franklin, working in the same field, in the same laboratory, would eventually stop talking to one another. They worked separately on the structure of DNA. Unknown to Wilkins, his boss Randall told Franklin she would take over Wilkins’ work on DNA. Remarkably, he didn’t tell Wilkins this. The situation was worsened by the fact that Wilkins was absent for the first week or two after Franklin’s arrival, when Franklin became Gosling’s doctoral advisor. Randall confused his key researchers about their status in the laboratory’s DNA research work. When Wilkins returned, Franklin thought he was trying to muscle in on her research territory. On the other hand, Wilkins believed Franklin had joined his DNA team and he was bewildered by her unwillingness to communicate. As the truth of the situation slowly dawned on him, Wilkins was angry that an attempt was being made to wrench his promising work on DNA from him – and in such a devious way. He had no intention of stopping his DNA work. Franklin and Wilkins each thought the other was acting unreasonably. Wilkins, a painfully shy man, was baffled by Franklin’s growing hostility. Franklin could be highly confrontational and actually enjoyed heated arguments. Wilkins would recoil from such confrontations, so the air was never cleared between them. The sour atmosphere left Raymond Gosling, the research student, in an uncomfortable position. Gosling came to believe that Randall deliberately engineered the conflict, thinking the competition between Franklin and Wilkins would be beneficial to the laboratory’s work program! Wilkins was a hesitant man with a social conscience. He was wracked with guilt about the civilians in Japan killed by the atomic bomb he had worked on. He had been married for a short time in California, but the relationship had fallen apart. He felt guilty about that too. He sought help in the form of psychiatry. He asked his psychiatrist how to improve the situation with Franklin, but in the end failed to follow through on the advice. In May 1951, at a conference in Naples, Italy, Wilkins showed his audience an excellent X-ray diffraction photo of DNA taken by Gosling before Franklin arrived. The photo established beyond doubt that DNA was crystalline and therefore its structure could be deduced by careful X-ray diffraction analysis. The image generated a lot of interest, including from James Watson, a young American biologist. In July 1951, at a conference in Cambridge, Wilkins talked again about his X-ray diffraction study of DNA. Francis Crick was in the audience. Even though he and Wilkins were good friends, Crick paid little attention – he wasn’t much interested in DNA. If, however, he had known that genes are DNA, he would have been very interested, because like James Watson, he wanted to solve the mystery of the gene. Rosalind Franklin was also in attendance, but was unimpressed. She waited at the door to tell Wilkins to stop his X-ray work. “Go back to your microscopes,” she demanded. Wilkins was shocked. Also in the summer of 1951, Wilkins asked his physicist colleague Alex Stokes to perform a theoretical calculation to see what an X-ray diffraction picture of helical DNA would look like. Stokes was something of a genius in this type of calculation and, using Bessel functions, completed the work within a day or two. On November 21, 1951, Wilkins, Stokes, and Franklin talked about their work at a colloquium at King’s College. James Watson was there. Watson was excited about some of the data Franklin presented about DNA’s structure. He returned to the University of Cambridge, where he and Crick built a 3D scale model of DNA. It took them less than a week. When it was complete they invited the King’s College workers to see it. In fact, Watson had remembered Franklin’s data incorrectly. Watson and Crick’s model was a triple helix. Franklin argued that her X-ray diffraction photos provided no certainty of a helix. Moreover, Franklin launched a polite but devastating attack on the Watson-Crick scale model of DNA. Watson’s faulty memory, combined with the Cambridge duo’s inexperience in chemistry, had resulted in basic errors. When he got reports of the meeting, Lawrence Bragg, head of Cambridge’s Cavendish Laboratory, instructed Crick and Watson to stop their DNA modelling work – they were not to compete with King’s. On May 2, 1952, Raymond Gosling took Photo 51 – an X-ray diffraction photo of DNA. Photo 51 became notorious because of unfounded allegations that Wilkins obtained it later in an underhanded way. Photo 51 was so perfect that it screamed ‘helix’ to anyone familiar with X-ray diffraction. About a month after Gosling took Photo 51, Franklin announced she would be leaving her job at King’s to do X-ray work at Birkbeck College. In January 1953, with Franklin’s departure looming, Wilkins became Gosling’s doctoral advisor. Naturally enough, Gosling showed him Photo 51. The photo’s greatest significance was probably that it provided James Watson with a dramatic scene, when Wilkins showed him the photo, for his controversial 1968 account of his DNA work The Double Helix. In truth, however, other than marvel at the sharpness of the image and note how clearly it confirmed DNA’s helical structure, Watson could do little else with it. In any case, Watson, Crick, Wilkins, and Stokes had never doubted DNA’s structure was helical. While Watson was seeing Photo 51, Lawrence Bragg was learning that Linus Pauling was working on solving DNA’s structure. Bragg had a grudge against Pauling; the prospect of Pauling winning the DNA race was intolerable. From Bragg’s viewpoint, the researchers at King’s had been generating plenty of data, but didn’t seem to be able to figure out what it meant. He authorized Crick and Watson to restart their DNA model work. By March 7, 1953, Crick and Watson had cracked the DNA code, helped greatly by data Franklin had provided in a report. Crick and Watson invited Wilkins to see their 3D scale model on March 13. Wilkins had been delighted by the prospect of Franklin leaving King’s. He truly believed she had been obstructing progress. With her gone, he expected his team would win the race to discover DNA’s structure. When he saw the perfection of the Watson-Crick model, his frustration and anger overflowed – he aimed bitter words at the Cambridge scientists. Although at an earlier meeting he had grudgingly accepted Crick and Watson were re-entering the race, he thought it was a race he would win. He angrily rejected their offer to co-author a paper with them. Instead, Randall and Bragg, the heads of the laboratories at King’s and Cambridge, agreed that their researchers would write separate papers. We have also been stimulated by a knowledge of the general nature of the unpublished experimental results and ideas of Dr. M. H. F. Wilkins and Dr. R. E. Franklin and their co-workers at King’s College, London. Crick, Watson, and Wilkins shared the 1962 Nobel Prize in Medicine for the discovery of DNA’s structure and its replication mechanism. Rosalind Franklin died in 1958, and Nobel Prizes are not awarded posthumously. While working at Berkeley on the Manhattan Project, Wilkins met and married Ruth in 1944. It was a poor decision for both of them: they soon divorced. In 1945, Ruth left for the Pacific Northwest to begin a new life and raise the child Wilkins had fathered. In 1959, age 42, Wilkins married Patricia Ann Chidgey. They had four children: Sarah, George, Emily, and William. Between 1966 and 1968, Wilkins and Crick fiercely but unsuccessfully resisted publication of Watson’s groundbreaking book, The Double Helix. The book told the DNA story in a breathless, gossipy manner. Rosalind Franklin, who had died in 1958, was portrayed unflatteringly. Despite the troubled relationship he had endured with Franklin, Wilkins objected strongly to Watson’s portrayal of her. In 1970, age 51, Wilkins became director of the biophysics laboratory at King’s College following John Randall’s retirement. 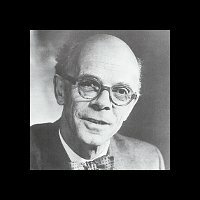 Wilkins retired and became emeritus professor of biophysics in 1981 at the age of 65. Maurice Wilkins died age 87 in London on October 5, 2004. Images drawn or digitally enhanced and colorized by this website. © All rights reserved. "Maurice Wilkins." Famous Scientists. famousscientists.org. 29 Aug. 2016. Web.